Have you ever stayed at a 5-stars hotel? Or bought a 20 dollars pizza? Hmmm, why doesn’t that sound right??? A lot of English learners often make this mistake and don’t even know it. 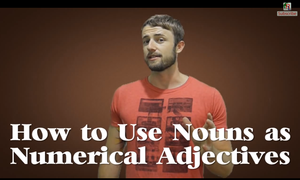 Check out this video lesson and find out all about why it’s incorrect to pluralize a noun when it is being used as a numerical adjective. Remember to read the transcript below if you have any problems understanding what I’m saying. Welcome to another episode of Real Life TV. I’m Chad, and today I’m going to teach you all about how to use nouns as numerical adjectives. Aww yeah! Ok, so, one thing you guys must already know and have to remember very quickly is that in English, when we use adjectives, it always comes before the noun. For example: a white cat; a black dog; a red car. But, in English, we often use numbers to describe that noun, and that’s what we call a numerical adjective. For example, have you ever stayed at a five-star hotel? A five-star hotel? If it’s five, why do we say “star”, and not “stars”? That is because in English we have a rule, where when you use a number as an adjective, you never put the number in the plural, the noun of that number. So, in this case, I said five-star, I never say “stars”, five-star hotel. Five-star hotel. So, some other examples of this are, any, think of anything that you can count. So, for example, a day, a twelve-hour day. “Day” is the noun and I’m using “twelve-hour” to describe the noun “day”. So, have you ever worked a twelve-hour day? Not twelve hours, twelve-hour day. So I’m going to go through some examples right now. I’m going to give you a complete sentence and I want you to try to rephrase this so you’re using the numerical adjectives. For example: think of a job which’s salary is twenty thousand dollars. What would you call that? That’s right, if you said a twenty thousand-dollar salary, you’d be correct. Let me give you another one. A meeting which lasts for two hours. What would you call that? A two-hour meeting. Today I had a two-hour meeting. Let’s think of a soccer team. A soccer team has five players. So, you can say it is a five-player team. Ok, another one. A family that has three children. What would you call that? That is a three-child family. Not the plural, which is “children”, we use the singular, which is child. A three-child family. Let’s think about the month of February. February has 28 days. So, I could say that February is a 28-day month. It’s a 28-day month. Ok, so, hopefully with all these exemples that I’ve just given you, you can understand how numerical adjectives work, and can also see how common, and how easy they are to use in English. All you have to do is just remember that, when we use numbers as an adjective, a numerical adjective, remember the noun never has plural, it’s never in the plural form. subscribe to our YouTube channel, where you can get many many more awesome videos like this, and don’t forget to go to our website, there’s a link in the box below, that will take you back to the post on the website, where you can see everything that I’m saying on the transcript. Ok guys, thanks a lot, and I hope to see you next time on the next episode of Real Life TV. Dear Mr. Chad, thank you very much for your good tips. Thank you for this five-minute lesson! Great! very good! Thank You very much indeed ! Thank you Chad,you helped a lot!!!! Thanks a lot,this is very useful because i didn't know that,but it's clear..